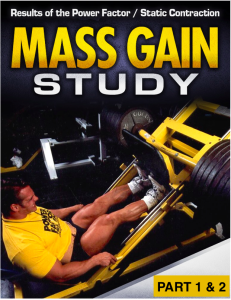 From 2014 to 2015 we ran an informal study among our customers to test several methods of training to see what specifically delivered the best mass gain. Every participant did exactly the same exercises performed exactly the same way. They were divided into three groups who performed timed sets of 30, 60 and 90-seconds each. One set per exercise and only six exercises per workout. Every group averaged impressive gains, but the group performing 30-second timed sets was a standout from the others. I don’t even like reporting this, because it just sounds like the kind of ridiculous hype I dislike about the strength training business, but the reality is that people who did this workout during our little study gained 1/4 lb of new muscle per minute of training. That’s a bulls-eye in terms of squeezing maximum growth stimulation from minimum time invested. It’s the reason we take all these measurements. 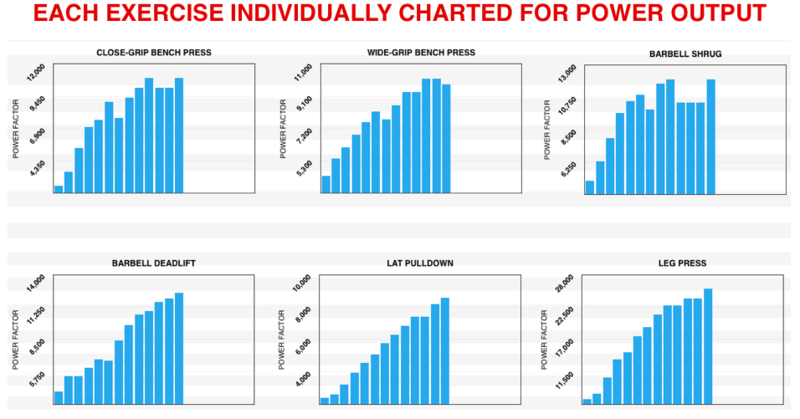 There’s just no way a person would arrive at his peak level of power output time after time and trigger that amount of growth stimulation by stumbling around blindly with all the possible weights, all the possible reps, and all the possible days to show up at the gym – and still get peak power on every exercise the way our system does. Objective numbers mean you see your progress in black and white. The numbers do not lie – either you are stronger than your last workout, or you are not. Just do your workout – then tell us your numbers. We’ll take it from there and do all the calculations of of your Alpha & Beta Strength, your Volumetric Intensity, and your personal rates of progress and recovery. Then we’ll send your new goals and the earliest date of you could hit those goals – all based on YOUR personal performance. 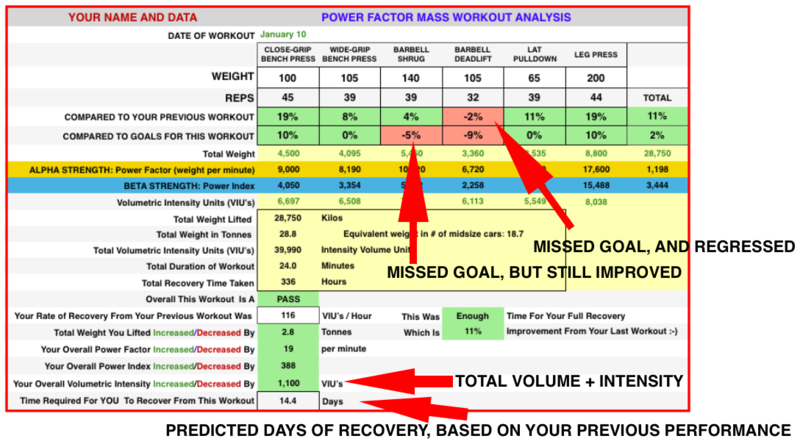 You’ll receive an analysis of every Power Factor MASS GAIN Workout you perform. Your new goals and your next workout date are all calculated based on your individual rate of progress and recovery. Why? Because numbers don’t lie. You’ll see your performance in black and white after you send us your data. Either you improved, or you did not. There’s no hype or muddled thinking. Science and math replace empty, macho talk. This workout program is a true bargain. I guarantee you won’t find a nutritional supplement that could stimulate this much muscle growth. The MASS GAIN Study e-booklet is packed with info and it’s included when you sign-up. You owe it to yourself to use this workout. It costs less than a bottle of supplements and it can be delivering results starting with your next workout. Really! Month to month, no commitments. Train with the Power Factor MASS GAIN Workout as long as you like, quit at any time, with no notice, effective when you say so.